Very Fragrant. 3 to 4 Feet. July flowering. These stunning, rose red flowers are huge and strongly out to upfacing, making this a great midsummer accent in the lily garden. Note that the buds remain green-striped even when fully colored and ready to pop open. 'Sensi' may well be the most vividly colored and dramatic lily we grow. Lovely fragrance and its solid color, easy to place in the garden. 3 to 4 Feet. July Flowering. Very Fragrant. 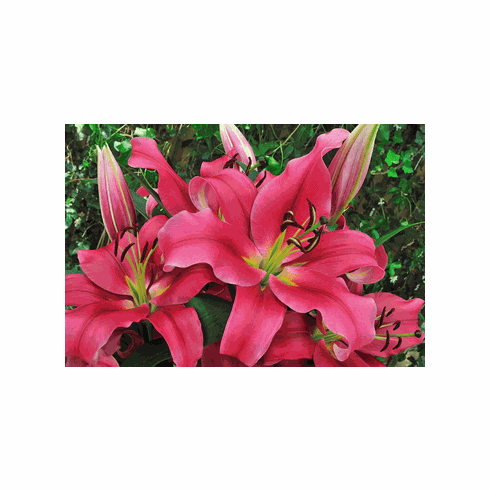 Bulb Size - Our standard for bulbs of this Orienpet Hybrid Lily Bulb cultivar ranges from Premium-size (16/18 cm) to Exhibition-size (over 20 cm). Click here for details.